Pigs are some of the most intelligent and sensitive animals on Earth. They even have the intelligence of a 3-year-old human. Yet, we treat them like objects to be tortured, slaughtered and consumed as food. 38 states in the U.S. still allow farmers to keep sows used for breeding in cages called gestation crates. These crates are so tiny the pigs can't even turn around. Then they are repeatedly impregnated and made to give birth. It's cruel and it must end. Please join in asking for the 38 states without laws against gestation crates to pass them! 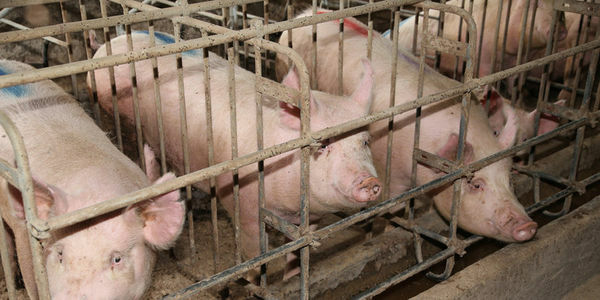 Gestation crates contain no bedding and instead are usually just slats of plastic or metal in order to make cleaning up waste easier on the farmers. Not only can the sow not turn around, she doesn't even have room to lay down on her side like she would normally. There is no reason for pigs to endure the torture of being pregnant not by choice and then not even being allowed to move or sleep comfortably. Even those who choose to eat pigs cannot justify making pigs suffer so greatly. This is the only life a sow will know. Once she's given birth to enough litters, she will be 'culled' or murdered, never having seen the outside of her miserable space. This is all done to increase profit and make life easier for the people who enslave the animals this way. This heinous practice is banned in the UK and Sweden, too. Please sign now if you want every single state in the US to pass legislation ending this immoral practice.